This is NOT a scholarship. This program is NOT employment, does NOT fund research, research-related activities, award scholarships, or provide financial aid assistance of any kind. A stipend is provided to offset living expenses during the fellowship period. Eligibility. Graduate and professional school students and those who have completed graduate studies (degree awarded) within the last five years may apply. Areas of study may include social/behavioral sciences, health and medicine, physical or biological sciences, engineering, law/business/public administration, or relevant interdisciplinary fields. Learn more about eligibility. Reference Requirements. TWO online references must be received prior to application submission. You will NOT be able to submit your application until BOTH references have been received. References must be relevant to your academic, professional, volunteer or other related experience. Even if you have applied for a fellowship in the past, you MUST complete a new application. Incomplete applications will not be considered. Application materials do not carry over from session to session. 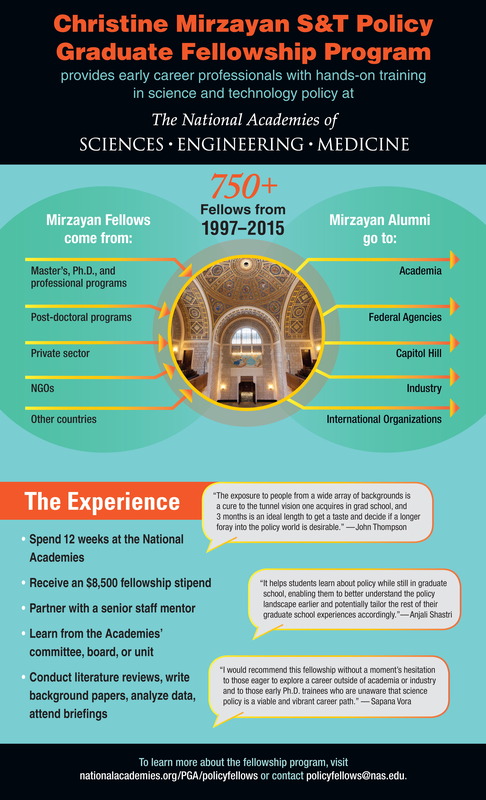 The 2019 session of the Mirzayan Fellowship will begin on January 22 and conclude on April 12. 1. Review your eligibility. This is an early career fellowship program. Graduate and professional school students and those who have completed graduate studies (degree awarded) within the last five years may apply. Areas of study may include social/behavioral sciences, health and medicine, physical or biological sciences, engineering, law/business/public administration, or relevant interdisciplinary fields. Learn more about eligibility. 2. Review the Prospective Units page. Click on unit links to find activities that interest you. Consider e-mailing unit staff to gauge their interest in hosting a fellow. 4. Notify Referees. TWO references are required. These must be relevant to your academic, professional, volunteer, or other related experience. Towards the beginning of the application form, you will be asked to provide an email address for each referee. Complete this section right away to ensure that your referees have adequate time to submit their reference before the application deadline. Mailed reference letters will NOT be accepted. Please alert your referees that they will receive an automated "Information Request" email from Scholar Select/Mirzayan S&T Policy Fellowship Program. This email will contain a unique link to a recommendation form to be filled on your behalf. An email confirmation will be sent to you when a reference has been received. To ensure delivery of the recommendation request, you may wish to ask your referees to add policyfellows@nas.edu to their contacts, email address book, or safe senders list. 5. Review all sections of the application prior to submission. 6. Submit application by the deadline. Review Frequently Asked Questions to gain a better understanding of the program. Review Meet Former Fellows to gain a better understanding of the type of educational and training activities that alumni participated in while at the National Academies. Consider e-mailing program alumni who have served as fellows in units you are interested in exploring or those with whom you may have a personal connection (e.g., went to the same school, have a degree in your field of study, etc. ).